Port Douglas is located in Far North Queensland (FNQ in local speak) in Australia. It is a long way from anywhere, being 2,482 kilometres north of Sydney (all distances are by road anf the most direct route - which is not along the coastline), 1,770 kilometres north of Brisbane and 3,025 kilometres north of Melbourne. The nearest city is Cairns (65 kilometres away) which also has an International Airport. Port Douglas and Cairns are the two major access points to the Great Barrier Reef. Numerous day and overnight dive/snorkel boats leave from both ports. This article is an attempt to provide a little information to help people who are planning dive holidays running out of Port Douglas. As mentioned, other than driving a very long way from your home in Australia (it takes a minimum of 2.5 days from Sydney - driving from 8 am to 6 pm and only stopping for quick food breaks) is to fly to Cairns. Virgin Blue, Qantas and JetStar fly there from most Australian cities although if you are a scuba diver and taking your own gear, forget about JetStar as you will be hit with excess baggage charges that will probably negate any saving. You can get flights from Sydney (for example) for about $150 to $160 each way in early 2007 if you book far enough ahead. It is about 3 hours from Sydney and 4 hours from Melbourne. There are some international flights in and out of Cairns, including Qantas (from many places including Japan, Singapore and Hong Kong), Continental Mirconesia (Guam), Air Nuigini (Port Moresby), Air New Zealand (Auckland) and more. Once in Cairns, the best way to get to Port Douglas is to catch one of the many min-buses. You could arrange once you arrive but I think it is probably better to do before you leave home. If you are booked on a liveaboard, the operators can probably help you find a company. If you have a few people going, it is wise to book ahead as you can get about $5 off for a group booking. The cost each way in 2006 was $22.50 and $17 for a large group. It takes about 45 minutes to get to Port Douglas but the trip will take longer if there are lots on the bus and you are the last to be dropped off. There is a huge amount of accommodation in the area. This ranges from backpackers to the best resorts. If you are going on a liveaboard, you will probably be leaving Port Douglas in the late afternoon or early evening so the best bet is to arrive in Cairns about midday and catch the bus up so that you will not need accommodation the first day. After your trip you will need accommodation unless you do not dive on the last day. I cannot really recommend any accommodation except to say that I would not recommend Parrotfish Lodge. This is an establishment that on the outside (and its web site) looks like an upclass backpackers. Unfortunately it is a bit run down, the bathrooms and toilets were not cleaned in the two nights we stayed there, it has insufficient toilets for the number of people it holds and it has draconian rules. This is the only backpackers I have ever stayed at (and only hotel/motel for that matter) anywhere in the World that did not permit you to drink your own beer/wine on the premises. This place has a licensed bar. Even if you try to have a beer around the pool or in the first floor lounge (well away from the bar), even when the bar is not open, you will be threatened with expulsion. We were having a quiet beer in the lounge when the manager told us to take our drinks and leave. The signs are even more threatening, stating your drinks will be confiscated and you will be thrown out of the accommodation for good. Needless to say we did not eat or drink at this place after this. It was fairly cheap from memory. It is located in the street that runs parallel to Macrossan Street (the main street) and is almost two blocks back from Wharf Street which is the street that fronts the water. It is a very easy walk to all restaurants and hotels. In 2007 when we again went on the Undersea Explorer, we stayed at Palm Villas. This is straight opposite Parrotfish. It was very nice, with each room have a double or twin bed, a small kitchenette, a lounge area, nice balcony and pay TV. It has a pool and a BBQ area. However, it is a lot more expensive and I am not sure that I thought it was worth what we paid, considering we were only there for less than 16 hours. The owner/manager was very nice and we stored our bags here after we booked out and before we caught the bus to the airport. This was not booked by me but by someone else and my wife did not really check it out before agreeing to it. The cost for one night was over $130 but this drops to $90 for about 5 or 6 nights. As for the Parrotfish, it was close to everything. Nearly everyone else stayed at Club Tropical Resort. This is on the corner of Wharf Street and Macrossan Street (the main street). It is excellently located and looked nice. All the people who stayed here said it was nice. I am not sure what they paid but on their web site it was even more than Palm Villas. If you are going on a liveaboard and are able to take your own alcohol, there are at least four bottle shops in the main street. The best two for prices were up from the Court House Hotel about 50 metres and on opposite sides of the road. Forget about the one next to Coles, prices were much higher. As to having a few drinks out, well the Court House Hotel is nice and they have a Happy Hour from 5 pm to 6 pm. They have a live musician most nights (at least while we were there) although we found this way too loud on the first trip. There are three other pubs in the main street. 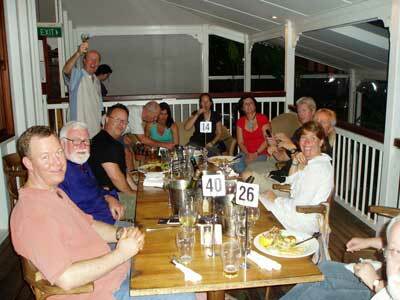 Paddys (why would you want to go to an Irish pub in FNQ? ), the Iron Bar Hotel, an outback themed hotel as well as another pub. The Iron Bar is quite good and the other one also had a lot of people at it. We also had some left over beers and wine at the end of our dive trip so one night we bought some nibblies (see food below) and went to the park out past the end of the main street. There are some tables and chairs there and it is a very nice place to have a drink before dinner (better than the pubs). The Coles in the main street sells things you might need for your trip. However, it closes early compared to Australia capital city times, shutting at 5:30 pm exact on Saturdays. Heaps of them. We ate at a few places. As many of the dive boats leave on a Saturday night, you will probably arrive about lunch-time (remember in Summer, Queensland is one hour behind the other eastern states). We had a few beers and lunch at Iron Bar Hotel (the third pub on the right in the main street as you walk from the water). This is done up as an old time Australian Pub and is quite nice. The prices of food were reasonable and the food good. We had dinner at the Court House Hotel the same night. As we had eaten not all that long ago, we selected a plate of small spring rolls, curry puffs etc. This was very nice and delivered fairly quick. We also had dinner here after one trip and all the meals were good and delivered quick. On the night after we got off the boat we had dinner at a wood-fired pizza place in the main street. This was up past the first pub on the left. It was excellent value. The next day we had lunch again at the Aussie Pub and that night we had dinner, at a Chinese or Thai place from memory. As there is so much competition, the prices are not too bad. However, you should check the menu before you enter as some places are well up market and not only out of my price range, out of my level of comfort! 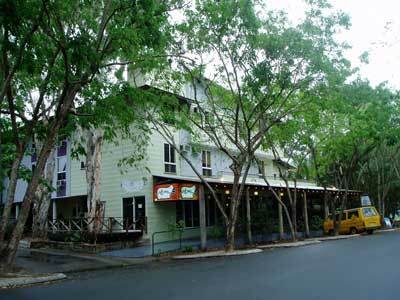 As you will need to stay at least one night and not fly till at least lunch-time the next day, you will need to spend a little time in Port Douglas after your trip. If you are flying out the next day at lunch-time (there are flights to Sydney about 1:30 pm), you can walk to the marina for breakfast or morning tea before catching the bus to the airport. In 2006 we ended up staying an extra night and all we did was get up real late, go to the marina (where we saw Donald Sutherland, Matthew McConaughey and Kate Hudson get off a dive charter boat - they were filming a movie called Fools' Gold), swim in the accommodation's pool, have lunch, shop and generally laze around. It was nice to just relax after the hectic week diving. 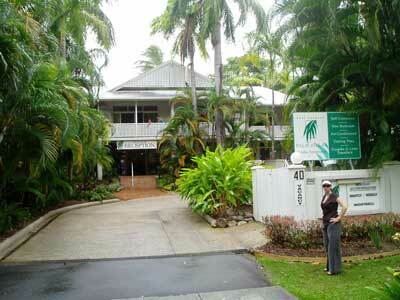 You could hire a car and go to the Daintree Forest, but as we have done this before, we did not want to do again.